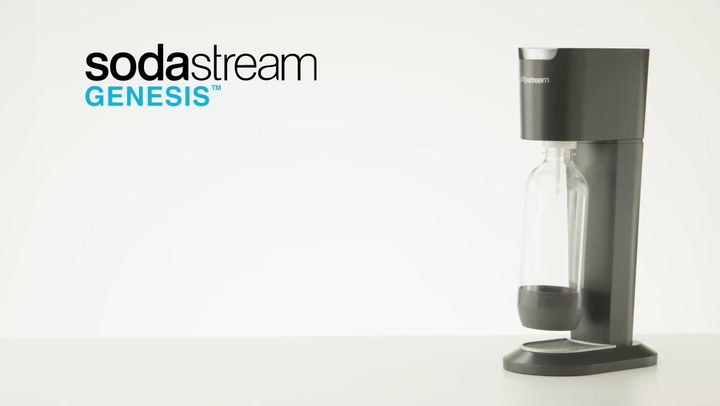 The Genesis Sparkling Water Maker turns water into sparkling water in seconds and is designed to fit beautifully in any modern kitchen. This starter pack includes a Genesis soda machine, two 1 litre carbonating bottles, two 500ml carbonating bottles and a Model 60 full cylinder. In stock, ships from us in 3 to 5 days. View more from Gifts for The Health Conscious, Soda Machines, Sodastream Makers. Does not carbonate as efficiently as I am used to when using the previous model. I use a Soda Steam daily - and if I had not disposed of the packaging I would have returned it. Best buy yet. Everyone is enjoying the Sodastream. Great & Easy to use! We love having this in our home with all the extra bottles makes it great to travel with. Greatest item bought thus far!!! This is the best bought ever. Would recommend this to anyone, especially if you are a diabetic and want to drink some fizz. No more flat sodas, wasting plastic in my fridge! What a difference - no more bottles of flat soda (at exorbitant prices) in my fridge! No more having to recycle plastic bottles! Fizzy water on demand - wonderful! Product works well and is easy to use and Yuppiechef's service is amazing!